Recognising it also has the potential to save lives, in a world first, the US Marine Corps have teamed up to operate the world’s largest concrete 3D printer according to The Urban Developer. The ability to build structures while putting fewer people in danger is a significant incentive to utilise cutting-edge technology and autonomous systems. One the US Armed Forces have adopted. Last month, an expeditionary concrete 3D printer was used to print a 500-square-foot barracks hut in just 40 hours. This time frame is drastically shorter than the five days it normally takes 10 Marines to construct a barracks hut out of wood. “This exercise had never been done before,” Captain Matthew Friedell says. “People have printed buildings and large structures, but they haven’t done it onsite and all at once. 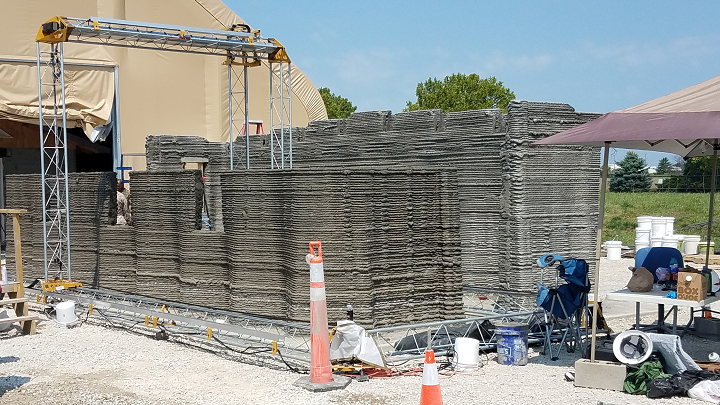 In building the structure, located at the Army Engineer Research and Development base Illinois, the team started with a design model on a 10-year-old computer, concrete and a 3D printer. The job took 40 hours purely because Marines had to monitor the printer and fill it with concrete. Although Friedell said if there was a robot to do the mixing the building could have been finished within a single day. In active or simulated combat environments, it makes sense marines shouldn’t be out there swinging hammers and holding plywood, Friedell explains. During humanitarian or disaster relief missions the technology also provides a way forward to quickly deliver shelter, schools and community buildings. “We can bring forward better structures, houses and forward operating bases with less manpower and fewer Marines in harm’s way,” Friedell says.